The Voyager 1452g is a wireless version of the Voyager 1450g area-imaging scanner delivering superior bar code scanning plus the freedom of Bluetooth® wireless connectivity. It offers a long lasting lithium-ion battery holding a charge for up to 14 hours at 40,000 scans per charge (4.5-hour recharging time) and Bluetooth Class 2 radio that enables movement up to 33 feet (10m) from base. 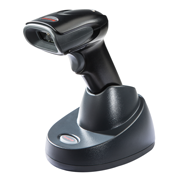 The Voyager 1452g area-imaging barcode scanner combines the powerful scan engine of the Voyager 1400g with the easy to hold pistol form factor of the Voyager 1250g. It allows enterprises to embrace area-imaging at their own pace, and in the most cost-effective manner, delivers omnidirectional reading of linear bar codes, plus the ability to affordably upgrade the device to enable PDF and 2D bar code scanning - either at the time of purchase, or as data capture needs evolve. The Voyager 1452g is a very reliable and competent instrument - not only can it read barcodes on a phone screen and at nontraditional angles, it ideal for the rough and tumble retail environment. Upgraded with Data Matrix Protection Plugin (DMPS Plugin) by 2DTG, Voyager 1452g becomes effective tool for product authentication and brand protection – ideal solution for retailers. It is constructed with a seal rating of IP42 to protect from dust and water drops, along with a sturdy housing that has a drop spec of 30 5' drops to concrete. It ships with a 3-year warranty standard. The Voyager 1452g ships pre-configured in a few configurations, ensuring you only pay for the features/options you need. Most configurations can be shipped within 1-2 days. Some configuration may require special order from manufacturer. Please contact Customer Support for product lead time.